Home / Piezometers / Piezometers: Types, Functions, & How it works? Home / Blog / Piezometers: Types, Functions, & How it works? Proper evaluation of pore pressure helps in monitoring the behaviour after construction and indicates potentially dangerous conditions that may adversely affect the stability of the structure, its foundation and appurtenant. It also provides basic data for design improvement that will promote safer and more economical design and construction. The next types of piezometers include electric piezometers that comprise of a deflecting diaphragm and a porous filter divided by a small reservoir of water. Vibrating wire or a strain gauge is used to calculate the deflections of the diaphragm. The calculated results are then converted to an equivalent pressure using a proper calibration. The next procedure is exactly similar to the open standpipe piezometers. The electric piezometer is inserted into a borehole while the annulus between the porous filter and the borehole is filled with cement/bentonite grout. Water from the ground pushes itself due to buoyant force into the reservoir and causes deflections in the diaphragm until the pressure inside the reservoir is the same as the pore water pressure (piezometric level) in the ground at the elevation of the porous filter. If an electric piezometer is installed above the current groundwater table, the pore pressure in the soil is negative and the water in the piezometer will be drawn out of the reservoir. If this happens, the piezometer will be filled with air, leading to its dysfunctioning. The third type of piezometers are the hydraulic piezometers that consist of a porous filter containing a reservoir of water, separated from a pressure gauge via resilient and water-filled tubes. These tubes circulate water through the system to remove air and ensure that the reservoir remains filled with water. The piezometer measures overall hydraulic pressure from which pore pressure can be calculated. The next type of piezometer is the pneumatic piezometer which is operated by gas pressure. It can be placed in a borehole, fills, or in a large diameter standpipe. The readings are then calculated with a pneumatic indicator. A magnetic, high tensile strength stretched wire, one end of which is anchored and the other end is fixed to a diaphragm. What is the pore water pressure/Piezometric Level? The pore water pressure/Piezometric Level is the pressure experienced by water contained in pores of earth materials or concrete structures. In any instrumentation scheme for geotechnical or geo-structural study associated with large civil engineering structures like tall buildings, dams, underground tunnels etc., measurement of pore water pressure (also known as the piezometric level) plays an important part. Effect of water in pores of soil or rock is to reduce load bearing capacity of soil or rock. Effect is more pronounced with higher pore water pressure leading eventually in some cases to total failure of load bearing capacity of the soil. To determine the flow pattern of water in earth/rock fill, concrete dams, and their foundations. To delineate the phreatic line. How does a Vibrating Wire Piezometer work? The vibrating wire piezometer basically consists of a magnetic, high tensile strength stretched wire, one end of which is anchored and the other end fixed to a diaphragm that deflects in some proportion to applied pressure. Any change in pressure deflects the diaphragm proportionally and this, in turn, affects the tension in the stretched wire. Thus any change in pore pressure directly affects the tension in the wire. The resonant frequency, with which wire vibrates, induces an alternating current in the coil magnet. The pore pressure is proportional to the square of the frequency and the Encardio-rite model EDI-51V readout logger (Data Logger) is able to display this directly in engineering units. The vibrating wire and coil magnet assembly are enclosed in a stainless steel body which is electron beam welded to the diaphragm. This result in a vacuum of around 1/1000 Torr inside the sensor making it immune to the effect of any ingress of water and other corrosive materials that may be present in the water. As piezometer is of stainless steel construction, it is not affected by normal chemical corrosion at locations in which it is used. A low air entry value ceramic flat filter with a thickness of 3 mm and a grain size of 40-60 microns is normally provided. The water oozing through internal pores or seams in rock formations of dam foundations, mass concrete of structures, foundation soil of structures, reclaimed land soil etc. percolates through the filter to pressurise the diaphragm. A locking nut holds the filter in position. For filling up the cavity behind the filter with de-aired water before installation and for saturating the filter with water, a bent nose plier is used to remove and again assemble the locking nut. Depending upon the application filters with different porosity and air entry values are available. The leads from the coil magnet are terminated on the glass to metal seal which is integrally welded to the stainless steel body of the piezometer. The two pins marked red and black are connected to the coil magnet. The other two pins are connected to a thermistor. A cable joint housing and a cable gland are provided for the connection. Normally, the piezometer is supplied without any cable attached to it. Cable jointing with the required length of appropriate cable can be easily done at the site. However, if specifically requested, piezometers are supplied with a requisite length of cable attached. EPP-40V slim size 19 mm φ piezometer is mostly used for monitoring pore pressure in boreholes during construction operation. This sensor is electron beam welded with a vacuum of around 1/1000 Torr inside it. A low air entry value ceramic flat filter is provided with a grain size of 40-60 microns unless specified otherwise. Cable jointing through glass to metal seal is just like as in model EPP-30V. However, if specifically requested, the piezometers are supplied with the requisite length of cable attached. EPP-60V low-pressure sensor is specially designed to measure low water pressure. The basic pressure sensor, in a diameter of 30 mm, is conveniently designed to measure water level, and water pressure in boreholes. The pressure sensor is used for applications in which maximum hydrostatic head (height of water level above piezometer location) is less than 7 m over the sensor diaphragm. EPU-20V is a vibrating wire uplift pressure measurement system that uses a vibrating wire pressure sensor. It is designed for monitoring uplift pressure of water in the foundation of dams and concrete structures. The sensor is similar to EPP-30V, except that instead of a filter, a 25 mm BSP adaptor is provided for the connection of a pipe. A perforated/non-perforated pipe is inserted in the borehole, on top of which the EPU-20V is mounted through valves and fittings. How to Install Piezometer in Borehole/Foundation? Installation of piezometer in a borehole is done with a fully grouted method. 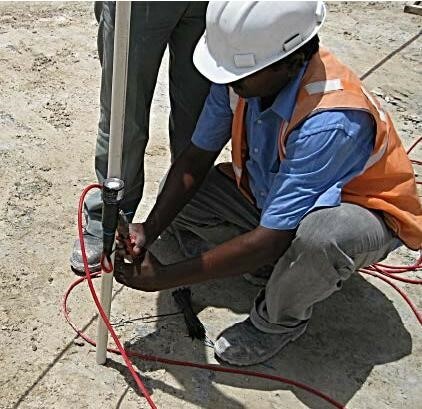 Installing multiple piezometers in a borehole using the traditional method, which involves placement of sand pockets surrounding the piezometers, bentonite seals and grout columns to separate piezometers at different levels, is slow and complex. It also poses a risk of unintended communication between piezometers. Fully grouted method is quick and easy and results in excellent zone isolation. Vibrating wire piezometers are the electrical piezometers of choice to implement this method as these require very little volume of water to register a change in pore water pressure, thus resulting in fast response time. How to Install Piezometer in Earth and rock fill dam? How to Install Piezometer in Concrete Dam? As access galleries are available in concrete dams, the cable from the sensors is first routed to the gallery. These cables may be terminated in junction boxes inside the gallery. The data from the various sensors can then be taken or logged from the junction boxes with the help of a readout unit or data logger. Alternatively, if required, the signals from the junction boxes may be carried through multicore cables to any observation room outside the dam structure. How to Install Piezometer in Soft Soil? For installation in soft soils the Encardio rite model EPP-50V push-in piezometer is recommended. It does not require any elaborate grout sealing below and above the piezometer as required for other piezometer models. The EPP-50V has a hard conical tip that allows the piezometer to be pushed in to the required depth from the ground surface or the base of a drilled borehole. Can a vibrating wire piezometer measure negative pore water pressure? A vibrating wire piezometer is the only device that can measure negative pore pressures because it indicates absolute pressures. 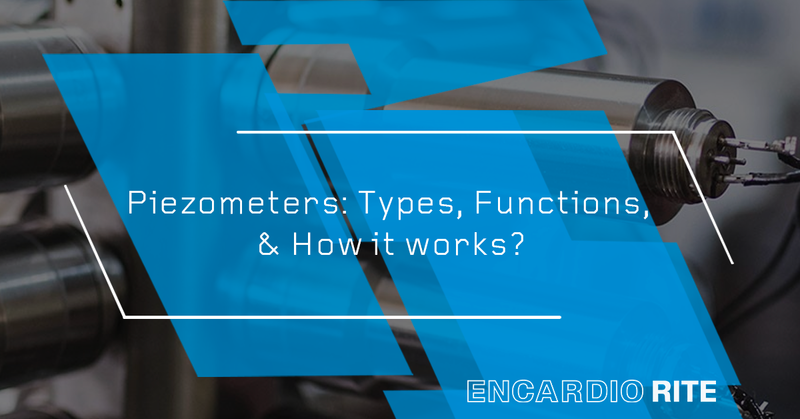 Encardio-Rite’s vibrating wire piezometers are fitted with high air entry porous filters that remove the air inside the piezometer so that the readings are accurate. Construction control, stability investigation and monitoring of earth dams, embankments, foundations, shallow underground works and surface excavations. Uplift and pore pressure gradients in foundations, embankments, abutments and fills. Hydrological investigation, groundwater pressure study and water supply operations. Reclamation of land in high population density areas in coastal regions for building highways, multi-storied structures, port trusts or recreational facilities. This requires extensive instrumentation for measurement of horizontal displacement, vertical movement and pore pressure. In coastal areas, it is necessary to determine and implement a strategy to overcome salinity problems and to increase community understanding and involvement in finding and implementing a solution. In many coastal areas, and occasionally inland, there is a danger that overpumping water from boreholes will cause saline water to replace the fresh water in the aquifer. Once this saline intrusion has occurred it is extremely difficult to remove the problem. Frequently, boreholes have to be abandoned and other water sources sought, often at high cost. Aquifers can be complex and include several saline horizons at different depths. Such horizons can be detected by multilevel piezometers and water sampling systems together with conductivity/flow logging in boreholes. What are the Limitations of Piezometers? Use of sensors in saline water is one of the most difficult applications from the point of view of corrosion. Great care should be taken for corrosion protection in case a piezometer is used for such applications. This is a tricky application and precaution must be taken to protect both the body and the diaphragm of the sensor. It cannot measure the pressure of the gas or vacuum. A piezometer is ideal to measure only the liquid pressure. This was all about Piezometers and, we hope you found this guide pretty helpful. If you have any queries or questions, do let us know in the comments section below.